Many years ago, I dabbled in making art glass windows. The colors and textures of the glass drew me in like a kindergarten student on her first field trip to the zoo. And the pattern – oh how I loved to come up with designs then work out which pieces to place where. I’ve wanted to get back to those windows again, but in the summer of 2016 I had the fortunate opportunity to take a class at Thompson Enamels by their very talented artist in residence, Tom Ellis. Tom has many years of experience and is one of the best instructors I’ve had the pleasure of working with. Within a day, I was completely hooked with this ‘new’ medium and slowly began practicing with my torch and taking additional classes as time allowed. Enameling on metal is an ancient art form which has developed through thousands of years at the hands of artisans as they used the medium to express their creativity. Vitreous enamel is essentially crushed glass the consistency of sand to a fine powder. It is worked into pastes using various binders or is carefully sifted onto metal substrates by the artist. The piece is then fired at very high temperatures until the enamel begins to flow and adhere to the surface. It’s development occurred in parallel with the use of glass by ancient Egyptian and Mesopotamian peoples between the third and fourth centuries B.C. with archaeological examples indicating its use to simulate gemstones. Through the Middle Ages, artists in Northern Europe and China began developing intricate designs with enamels and created processes to hold strong, vibrant colors into individual cells. The cloisonne enamel process uses thin gold, sterling or copper wires to create an intricate design. Enamel is then carefully placed into each cell and fired repeatedly to build up the surface of the object. Similar to cloisonne, champleve enamel is a technique where the artist will create cavities in a metal object by cutting or etching the surface, then filling the impressions with enamel. During the Gothic period, transparent enamels were developed along with colors in glass such as cobalt, bright reds and brilliant greens opening the door to a new realm of creativity. With the ability to see through the enamels fused onto metal, artists began developing methods to incorporate the metal surface itself into the design. The basse-taille, or bas-relief, technique of making a subtle relief on the metal surface prior to applying a transparent enamel over it gained popularity. Reliefs are made by engraving or embossing the object to be enameled using tools like gravers or stiles. Until the Renaissance, the enameling process was very dependent on the ability of the artist to work metal as well. Enamel artists at this time began to further grind the enamel into a very fine powder so it could be worked into a thinner consistency to create painted enamel designs. 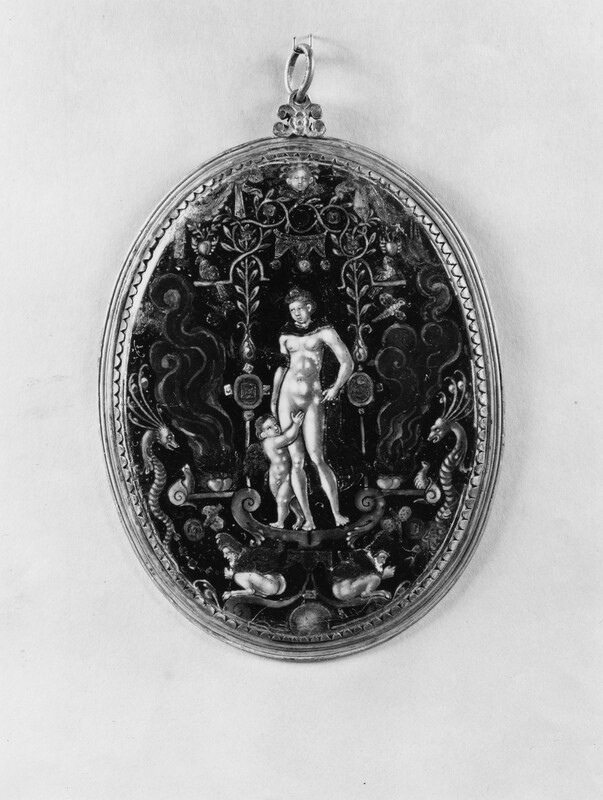 This made the ability to achieve extremely fine detail on enamel pieces possible without the use of techniques such as champleve or cloisonne to make designs in the metal. More recent advances in enameling occurred in the late 1800s with the resurgence of the plique-a-jour technique as an art form. Jewelry artists such as Rene Lalique, Tiffany and the enamelists at Plisson et Hartz created exquisite Art Nouveau designs that still capture the imagination today. Plique-a-jour is a complex process in which the artist draws a film of enamel across an open back cell, fires, then adds additional layers. Companies in the early 19th century began to realize the enormous opportunity to use enamels on utilitarian objects such as street signs, pots and pans, stoves, and bathtubs for the home. From this period forward, industrial enamel applications of simple opaque enamels became common in our daily lives. The more I work with enamel, the more I appreciate the artists of the past and their contributions. I hope you’ve enjoyed this post and can’t wait to hear about your vintage finds. P.S. Are you like me and intrigued by enamel? Here are some other examples of beautiful techniques of glass and metal love. Grisaille is the technique of applying layers of monochromatic enamel to a dark background. Taille d’epargne is the technique of applying opaque enamel to specific design elements of a sterling, gold or plated piece. Guilloche is similar to basse-taille in that a design is carved into metal and a transparent enamel is fired over the design. However, guilloche designs are made with specialized machinery and feature intricate repeating patterns.